New Rental in Twain Harte - Half way between lake and town! Small dog friendly with prior written approval from management team. Here we have a 4 bedroom cozy cabin that sleeps 10 people plus a fold out queen futon couch for two additional in the living room. There are two bedrooms on the lower level of the house each with their own separate entrance. One bedroom has a queen and a TV for DVD usage only. The second bedroom has a queen bed and and two twin beds. These bedrooms share a full bathroom, tub and shower. You will also find the washer and dryer on this level in the hallway just outside the bathroom. Up one flight of stairs you enter the screened in porch, great for your morning coffee or tea. Enter into he living room that is filled with great traditional cabin furnishings, very neat, clean and no clutter. 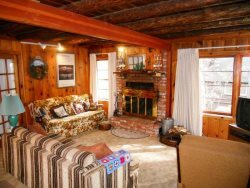 There is a beautiful gas log fireplace on a thermostat to keep you warm and cozy in the main part of the cabin as well as gas and electric heaters in the other locations of the house. You can exit the rear of the living room through the sliding glass doors on to the large deck where you will find a propane barbecue, fun night-time lighting and a table and chairs. Since the deck is at te rear of the house, it si peaceful and serene, surrounded by the tall cedars. Also on the main level you will find a great pivot kitchen (you can reach everything with a swing of the arm), small but mighty with a modern stove. Adjoining the kitchen is a nice eating nook with seating for six. On the main level of the house is a bedroom with a queen bed and a full bathroom, claw foot tub and shower. Upstairs, you will enter into a huge open loft bedroom with a king size bed and a half bath. The location of this house is great, walking distance to either downtown or to Twain Harte Lake and pushe up off the street for great privacy and quiet times. We must have 24 hour notice prior to your arrival. After hours number is 209-770-1624. RENTAL PARTY: Other than the allowed amount of Occupants for this Premises, no other guests, persons, or visitors are permitted to occupy the Premises. If other guests, persons or visitors as stated on your online booking or disclosed to the booking agent, occupy the Premises, a breach of this Agreement will have occurred and the Occupant, guests, the Rental Party, and all other persons, or visitors may be required to immediately vacate the Premises. If any of the conditions of this Agreement are violated, Owner or Owner’s representative may terminate this Agreement and enter the Premises. Occupant, guests, visitors and all persons will vacate the Premises immediately and forfeit all rents, fees and security deposit. For Occupant’s protection, THR recommends that Occupant purchases a vacation rental damage protection plan. This plan provides a well-rounded coverage for Occupant’s protection. This coverage may protect in the event the trip is cancelled because of sickness, death in the family or many other covered reasons. See THR website for further details. THR does not offer refunds or rebates for late arrivals, early departure, inclement weather, flight delays or cancellations, road conditions, power outages, or other personal issues. Our cabins are located in the mountain area where such events range from rare to frequent. In extreme emergencies such as broken pipes, THR reserves the right to cancel the reservation or substitute another available cabin. If for any reason beyond the control of the Owner or THR the Premises are unavailable, or in the event of a sale of the Premises, THR may substitute a comparable unit or cancel this Agreement with a full refund to Occupant of all payments received by THR. 7. MAINTENANCE: Occupant shall maintain and properly use the Premises for their intended purpose. Occupant shall immediately report to THR, any problem, malfunction or damage. Occupant shall pay for any repairs or damage to the Premises as a result of failure to report the problem, malfunction or damage in a timely manner. Occupant shall pay for any plumbing or sewer or septic repair of drain blockage or stoppage unless caused by defective plumbing or tree roots causing the lines to be blocked. 8. CONDITION OF PREMISES-Occupant has not inspected the Premises prior to signing this Agreement. It is the Occupant’s responsibility upon entering the Premises to examine all interior and exterior spaces and immediately report to Management any disrepair or non-operating systems. Reporting such items does not give the Occupant the right to cancel this Agreement or receive a refund or a rebate. 9. HOUSEKEEPING-All cabins will be cleaned and the fee is included in the Vacation Rental Agreement under Payments. (Housekeeping does NOT include washing dishes, emptying refrigerator, cleaning BBQ, cleaning oven. These remain the responsibility of the Occupant). If the Cabin is left exceedingly dirty or flooring stained etc., there may be an additional cleaning charge incurred. THR will provide one roll of toilet paper in each bathroom and 1 roll of paper towels in the kitchen. THR recommends Occupant comes prepared with additional paper products. 10. PETS-There are NO pets to be in the Cabins OR on any of the Premises without PRIOR WRITTEN APPROVAL. Violation will result in forfeiture of Security Deposit and immediate termination of the Vacation Rental Agreement. Occupant(s) will be 100% liable for any cleaning or repairs resulting from allowing pets in the Cabin or on the Premises. 11. SMOKING-ALL Cabins are NO SMOKING Cabins. NO EXCEPTIONS! If Occupant or guests smoke outside, please keep doors closed and pick up after yourself. 12. UTILITIES- Owner will pay utilities with the exception of all telephone charges to be paid by Occupant. TWAIN HARTE LAKE Occupant agrees to pay Twain Harte Lake Tickets if Lake Membership Home is rented. Tickets to Twain Harte Lake are not included in rental price of our cabins with lake privileges. Cost of tickets to be paid directly to the lake upon entering. The maximum number of Occupants and their guests may not exceed the amount stated for this Vacation Rental Agreement. For the benefit of our neighbors, THR asks that Occupant is courteous and quiet. For that reason, all noise must cease by 10:00 PM. Failure to comply with maximum number of Occupants and their guests and noise curfew will result in immediate removal from the Cabin and Premises and forfeiture of all rents and Security Deposit. Too many Occupants and guests in a Cabin are a HUGE strain on the septic/sewer system. Guest agrees to abide by the Rental Rules they receive at check in as well as any that are posted in each home while at the property and shall cause all members of the rental party and anyone else Guest permits on the property to abide by the following rules at all times while at the property. There is to be no use of Premises for any illegal or commercial use or for any reasons beyond that stipulated by the terms of this Agreement. 14. ACCESS- Guest shall allow THR access to the property for purposes of repair and inspection or emergency. Homeowner shall exercise this right of access in a reasonable manner. 15. INSURANCE-Occupant further agrees to indemnify, defend and hold harmless Owner and THR for any theft, damage, cost or expense whatsoever, from all claims, disputes, litigation, judgments, costs and attorney fees resulting from loss or damage or injury to Occupant, Occupant’s guests or licensees or their personal property. 16. MEDIATION: Occupant agrees to mediate any dispute or claim arising out of this Agreement, or any resulting transaction, before resorting to arbitration or court action. Mediation fees will be equally divided between the parties involved. SNOW REMOVAL-There is NO snow removal provided, including driveways, walkways and decks. Snow removal may be available at Occupants’ expense with advance notice. Occupant must pick up your keys as well as directions to the Cabin at THR’s office. If Occupant’s arrival is outside of THR’s normal office hours, THR’s office maintains a lock box for after hour key pickup. If Occupant will be arriving after hours or on a day that THR is closed, Occupant will receive instructions for accessing the lockbox upon payment in full of your rental fee. Please only prepaid reservations for after hour key pick up. There will be a $50 fee for after hour lockouts. Occupant must drop off keys at THR’s office no later than 11 AM the date of Check Out. THR is not responsible for inconveniences due to the elements. In the event that a problem occurs, THR will do everything possible to solve any problems in a timely manner. THR is not responsible for appliance failures, power outages or internet/television/wi-fi access. THR is not responsible for frozen pipes. Under such circumstances we are unable to offer a discount or return of rent or a rebate. Please know that THR will do everything possible to solve any problems but Life in the mountains can be challenging at times. Remember travel insurance is available for your trip. Many of our owners provide basic BBQ supplies including propane. Firewood is not provided. However we do NOT guarantee that your cabin will come equipped with propane, charcoal or lighter fluid. Please come prepared or check in with us ahead of time. All information in any marketing is believed to be accurate but is not guaranteed. Prices and amenities are subject to change without notification. Twain Harte Rentals will do the best to describe the house to the Occupant over the phone as well as on our website. THR will not be held responsible for any misconceptions Occupant may have regarding the house.